In addition to our traditional scaffold shrink wrap installation services, Rhino also provide a nationwide building wrap design, print and installation service. A building wrap is an extra large outdoor screen which is digitally printed using exterior grade UV stabilised inks to your custom / bespoke requirements. Building wraps provide a high impact ‘premium look’ covering which can disguise a project or advertise a message to passing pedestrians and vehicles. Our directly employed installations team are experienced in installing sheeting, banners and wraps safely in a wide variety of construction environments and work closely with your chosen scaffolding contractor to ensure the supporting framework for the wrap is designed & built to the correct specification. We are a supplier to most of the large construction contractors in the UK & carry all relevant health & safety certification. 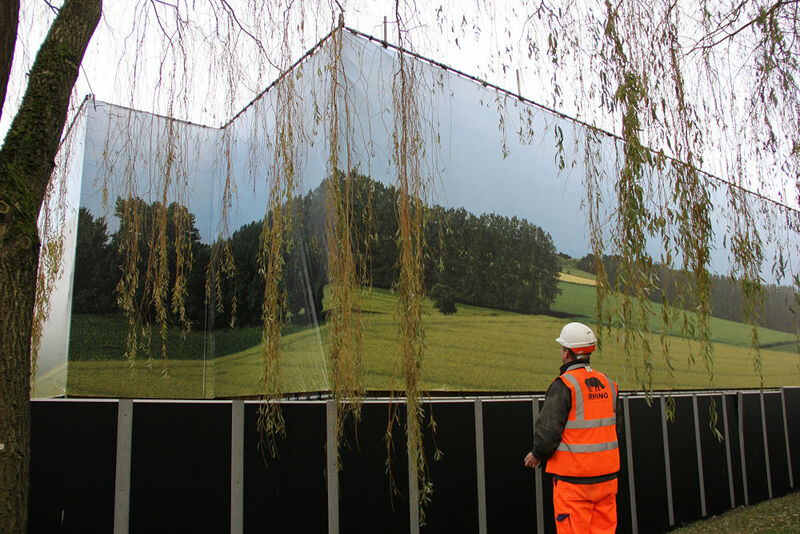 A building wrap is a heavy duty PVC mesh that provides some weather protection and containment of dust & debris but it’s main purpose is to disguise or advertise a project. Generally speaking, a giant building wrap will be printed with custom graphics which advertise a message or disguise a construction project, perhaps by using ‘one to one’ imagery of the building underneath (sometimes known as ‘Trompe-l’oeil’). 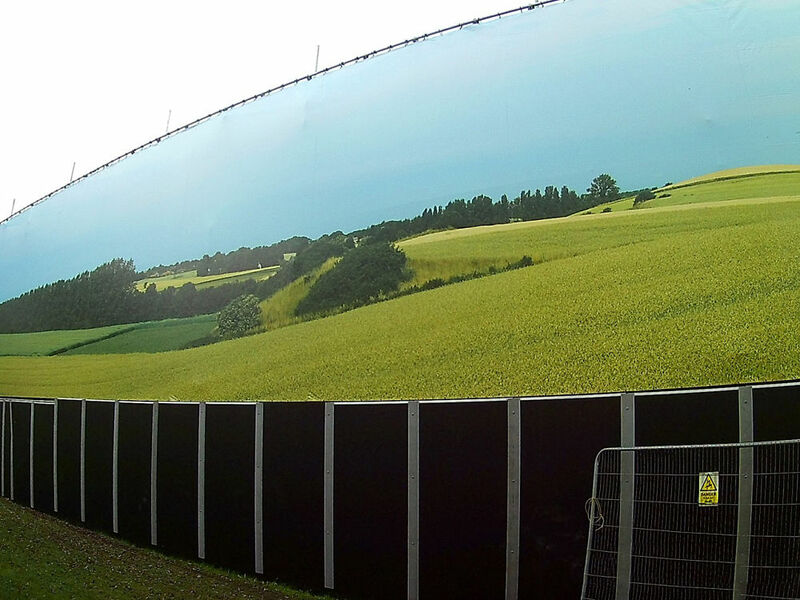 A building wrap is printed in sections, typically 4 metres wide each. These sections are laser trimmed and welded together in a controlled / factory environment using an ultrasonic welder. Heavy duty brass eyelets are installed around the edge of the banner into a 50mm reinforced welded hem. As a mesh material, building wraps will allow light and some wind to pass through the banner. Typically, the building wrap is attached to a frame that projected / extended away from the main body of the standard scaffolding. This gives that ‘drum tight’, premium finish that our clients are looking for. In addition to being secured around the perimeter of the banner, hidden fixings (often known as ‘dragon tails’) run vertically down the inside of the banner which allow the banner to be tied back to the scaffolding structure at multiple points. Rather than heat shrinking, a mesh building wrap / banner is tensioned using ropes and bungees. Whether you utilise our in-house design team or supply your own graphics, our team will ensure a straightforward and stress free process from first contact to final installation. What is the difference between a building wrap and shrink wrap? The terms ‘building wrap’ and ‘shrink wrap’ can be confusing. Shrink wrap sheeting is a heavy duty polythene film that creates a continuously sealed cladding around the sides or roof of a building. It is used mostly where a high level of weather protection or containment of dust and debris is required. However, shrink wrap is foremost an industrial product and although shrink wrap can be digitally printed, it is best suited to fairly simple branding such as a logos etc. Shrink wrap is usually supplied as a 7 metre wide roll and it is installed on the outside of the scaffolding, typically in 6 metre drops. It is attached to the structure by wrapping it around a scaffold tube and heat welding back on to itself. Individual sheets are joined together ‘in situ’ by the installation team overlapping and heat welding using a hand held propane gas heat tool. Finally it is heat shrunk ‘drum tight’, once again using a hot air tool.